Baalbek in Lebanon is one of the world's grandest archaeological sites. It's hard to imagine the size and greatness of the Roman-built Baalbek temples without actually being there. It was once twice the size of Athens' Parthenon. Another indicator is the size of several of the temple's brick-shaped cut stones - they measure 20 meters (63 feet) in length. The Corinthian pillars that supported the Temple of Jupiter roof were massive, too. Six still stand (see photo). It is one of the largest and best preserved ancient Roman sanctuaries despite having been severely damaged relatively recently (mid-18th century) by a fierce earthquake. However, today, it’s in better shape than its neighbors, which were also earthquake damaged. 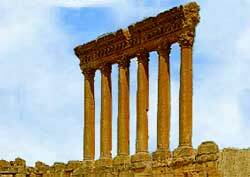 Baalbek means "Baal City" in Phoenician. It was named after the sun god Baal, the one now associated with pagan rituals.